So you'd like to join the Maine Gladiolus Society? Well, you've come to the right page! You don't need to be a Maine citizen to join MGS! While it's true that the majority live in Maine or the rest of New England, Maine Gladiolus Society has members all over North America. 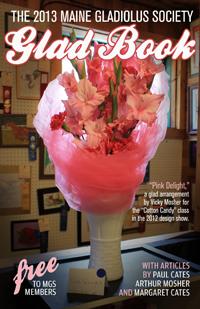 The benefits of joining the Maine Gladiolus Society include a free copy of MGS' annual publication, "Glad Book," invitations to join in discussions of society activities at the pre-show and annual meetings, and the satisfaction of helping to promote the growing and use of gladiolus in Maine. Society members are also encouraged to contribute their own content to "Glad Book." Maine Gladiolus Society's membership dues are extremely affordable at just $5 per person or $8 per couple per year. These dues help to fund the costs of promotional materials for MGS's annual show and annual bulb auction, as well as its meetings. Dues reminders are mailed to members each January. Your information will be promptly added to MGS's address list, so that you will receive the next-printed "Glad Book."